From Goodreads.com: Lady’s maid Leah Hunter must choose between two men. Valet Daniel Barlow makes her laugh, fills her heart with delight, and answers her body’s desire for love. But Felton Kensington would give her a better life. Security. Prestige. And choosing him would take away the one thing that plagues her mind with worry and confusion. 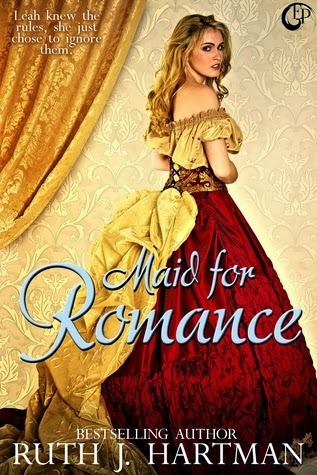 Another wonderfully sweet and clean romance by Ruth J. Hartman, Maid for Romance will have you sighing in your seat (when you're not laughing of course). From discussing cats in tiny corsets, to frogs captaining minuscule ships, this story will have you laughing out loud. I don't know where Ruth gets her ideas, but I certainly hope they never run out! The characters are unique (a valet and a lady's companion don't typically get their own romance novel), and it was a pleasure reading about these new characters whilst still getting the chance to spend time with Cecilia and of course Uncle Percy. Who doesn't love Uncle Percy? And once again, the man has proven to not only have a heart of gold, but also that he is most willing to take the most unusual means of getting things done. He is probably hands down my favorite character of this series. I do have to say I was rather unsure of Felton's character. I kept expecting him to have ulterior motives, or to let his anger slip out to show his true character. I do know that I did feel just a bit sorry for him at the end of everything. I would like to see more of this character, just to be able to get inside his head for a bit and see what he's all about. Maid for Romance is coming soon. Links will be provided.